I used to loooove Jammy Dodgers when I was younger and I wanted to re-create something that had the fruity middle, all wrapped up in a crumbly biscuit. These healthier Christmas versions are gluten free, refined sugar free, vegan and MUCH more delicious! Plus, they are super duper easy and quick to make with only 8 ingredients. From the moment you get that rumble in your tummy for something sweet, these bites of yumminess are ready and in your mouth only 20 minutes later, from start to finish. Minimal mess too….unless of course, like me, you make them with your little ones, in which case there will be nut butter in places you didn’t think possible! 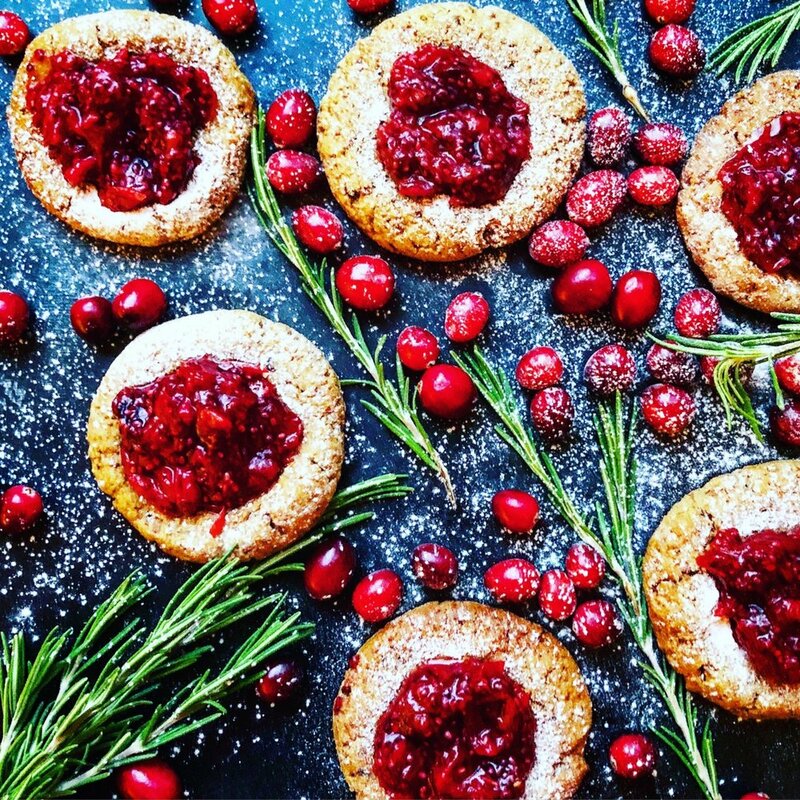 And to top it off, each cookie provides 4g of plant-based protein, 2g of fibre and 12% of my daily Vitamin C.
Options for the filling — if you made any of my Rosemary infused Cranberry Syrup and Chia Jam from my post on Friday (which I would strongly encourage you to do! ), then use the Cranberry Chia jam from that recipe for a real festive twist. But if not, then below is a recipe for a Plum Chia Jam that is equally delicious! · Line a baking tray with parchment paper. · In a large mixing bowl, add all of the cookie ingredients and mix well until thoroughly combined. · With slightly wet hands (so that the mixture doesn’t totally stick to your hands), roll approximately 1–2 tbsp of the dough into a ball then gently press down to flatten slightly on the lined baking tray. · Taking your thumb, carefully indent each cookie to create a nice little well for the jam. · Bake in oven for 12 minutes or until slightly golden. · While the cookies are cooking, make the chia jam. · Dice the plums and place them in a small saucepan on a low heat along with the water and the sugar. · When they have softened (after approximately 10 minutes), mash them and add the chia seeds. · Take off the heat and set aside to cool and thicken. · When cookies are ready and have cooled slightly, spoon the chia jam into the indent of each cookie and enjoy!